Falcons football claims a league title and state quarterfinal berth to cap 2018. Liberty High School's 2018 sports season has to start with the football team, which had its most successful season in school history. But it certainly doesn't end there, as the Falcons flew on the hardwood, the pitch and the track this past year as well. The newest of the four Hillsboro School District public high schools, Liberty won its first-ever football conference championship, finishing atop the Pacific Conference with a 4-0 conference record and 9-3 record overall. The Falcons won playoff games against Roosevelt and Sunset before falling in the quarterfinals to last year's state champions, Clackamas. Quarterback Brad Norman was selected as the conference's Offensive Player of the Year, while junior Marquis Brown took the same honor on the defensive side, and head coach Eric Mahlum took coaching honors. In all, the Falcons put nine players on the All-Conference first team, three on the second team, and 10 honorable mention. Ten players were honored by selection to the All-State team, including Brown as a first-team defensive back. "I'm just really proud of this group," said Liberty running back Aiden Maloney. "We made a commitment to each other and this team and came out this season and had a great year. We set a new bar for Liberty football, and that's something I think we can be proud of." On the pitch, the Liberty boys finished fourth in the Pacific Conference and won a playoff game against Tualatin before losing in overtime to top-ranked Summit in the second round. The girls finished fifth in the league and failed to qualify for the postseason. The Falcons were formidable on the hardwood as well this past year, with the girls — despite a roster littered with underclassmen — battling for sixth in the tough Metro League, then beating Lake Oswego in the play-in round before suffering a heartbreaking 46-40 defeat to highly ranked North Medford. The boys, too, qualified for state by going 12-14 and eking out a sixth place league finish. 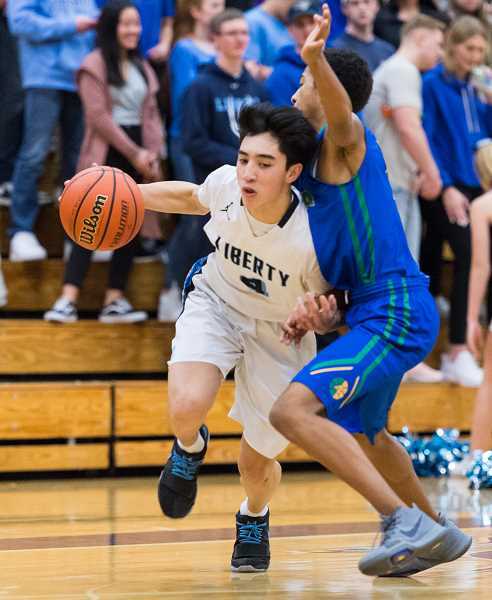 Led by Nathanael Boyer's 40 points, Liberty defeated Benson in the play-in round, then lost to state power Jefferson in the opening round. Nonetheless, the Falcons' postseason performance didn't go unrecognized by head coach Brian Martin. "I think our kids matured so much, and that maturity needs to carry on to next year for these returning kids," said Martin. "We desire to be a high seed and hosting playoff games, and that takes time. I think these guys set a great foundation. Now we need to build on top of it to get to a place like this." On the mat, Liberty placed 21st at the state wrestling meet and was paced by senior 285-pounder Dylan Thygersen. After losing a third-round match to eventual champion Tristan Osborn of Newberg, Thygersen placed third, winning four matches in the consolation bracket and winning by fall against Westview's Angel Omar Blas in the third-place final. Falcon point-earners included Thygersen with 26 points, junior Rafael Hinojosa (220) with four points, James Roy (132) with three points and Alejandro Antillon (285) with three points. In the spring, Liberty struggled on the diamond, although the softball team qualified for the play-in round, losing to Lakeridge 7-5. The baseball team finished 6-20 overall, and despite placing near the bottom of the Metro League and failing to make the playoffs, first-year coach Ryan Raagas saw a silver lining. "Certainly it wasn't the end that I or we had hoped for, but I learned and a lot, and for me that was a big thing," Raagas said. "I thought we steadily improved, and I think we competed even more than the kids thought we would. There's definitely a foundation here in which to build upon." 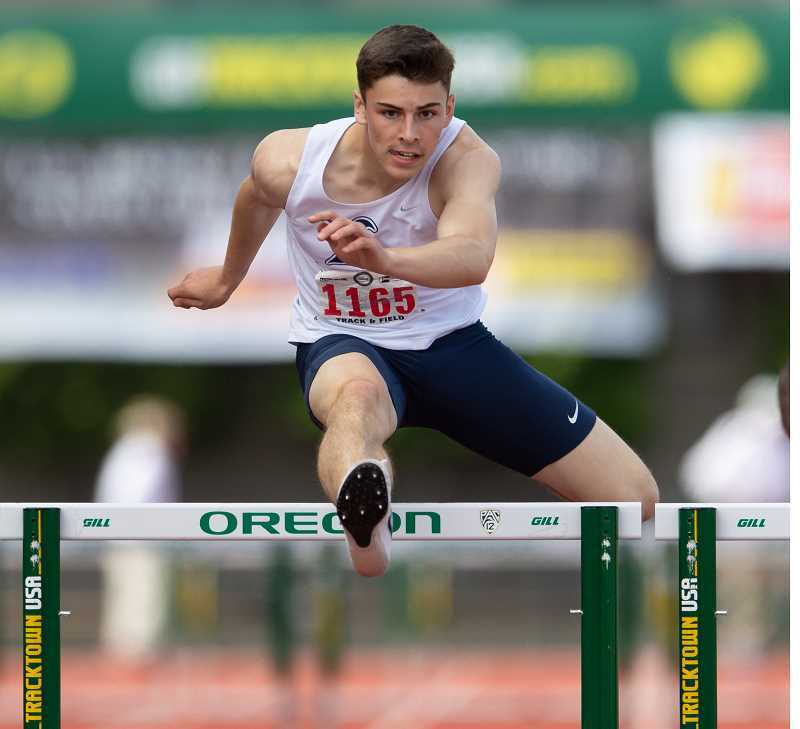 On the track, the Falcons were paced by standout Aiden Maloney, who, in addition to his work on the football field, did serious work on the track, placing second in the 110-meter hurdles, fourth in the high jump, fifth in the long jump and sixth in the 300-meter hurdles at the state meet in Eugene.